Posted in: General Market Thoughts. Tagged: $NYUD:$NYUPV, NYUPV. Since I began to seriously study markets back in 2009, I have yet to see a pull back that did not end with a capitulation, climax selling event. Per $NYUPV and $NYUD:$NYUPV, and a couple of others, we’ve had seven capitulation selling events year to date with the last occurring on September 25th. Today’s sell-off, as bad as it was, was not capitulation. Just as a market can correct through time, price, or both, markets can bounce through time, price, or both. While I am still looking for a bounce to the $SPX 1440 area, we are running out of time. Know the market you’re in. I’ll have more up over the weekend once I’ve had a chance to look things over. Posted in: General Market Thoughts. Tagged: $NYUD:$NYUPV, $SPX, $VIX, AAPL, QQQ. The 5EMA on that $SPX/$VXO chart has now dropped almost to 14 and the 5EMA on the $SPX/$VIX chart has now dropped below 15 so these are indicating a frothy market. Meanwhile, $VIX closed today at its lowest level in more than three years which is more evidence of market froth. Since I put up that first $SPX/$VXO chart last Wednesday, the 8th, $SPX has climbed a whopping 1.89pts. With the exception of pre or post holiday trading, today’s 1.8billion shares is the lowest volume this year. Below is another chart that does not come into play very often. The key is the Bollinger Bands. Those BB’s have squeezed about as tightly together as they’re going to. Please back test this chart and you will see that often, though not always, when the BB’s squeeze together they do so at turning points in $NYSI, which often precedes turning points in the market. If we were in a robust, dynamic market with lots of volume and participation from various sectors, then I would say that the BB squeeze would push $NYSI up, but we are not in that kind of market. Instead we are in a market where we are being led around by AAPL, GOOG, and a few others while, based on the low volume lately, most traders are off at Fire Island enjoying the last days of summer. One thing to note here is the positive divergence in the RSI 14 that took place in May & June and the negative divergence in the RSI 14 that is setting up now. I don’t think that $NYSI is going to climb up 60 some odd points and put in a new high but if it should over the course of the next few days I think it’s doubtful the RSI will put in a new high. The other thing to note is that $NYSI has been wavering since late July and that market strength has been inconsistent since then. The strong moves that brought $NYSI and the markets off the bottom in June are now being replaced by weakness and uncertainty and this suggests that we’ve seen just about all we’re going to see out of this particular rally leg, IMHO, of course. The market is all about making fools of those who attempt to divine its moves so while I am bearish here and looking for a pull back to begin sometime within the next few days, the market may have other plans. However, as I said last week, I’d be careful adding to existing long positions or initiating any new long positions until we get some clarity. Posted in: General Market Thoughts. Tagged: $NYADV, $NYDNV, $NYMO With Bollinger Bands, $NYSI, $NYUD:$NYUPV, $SPX, 4 Week New Highs/Lows, 90% Down Day, AAPL, Zweig Breadth Thrust. You can not have a bottom without a climax selling event. Friday’s action does not constitute a climax selling event. It is close but close does not count when there’s money on the line. It can become very agonizing waiting for a climax selling event because the market never goes straight down and there are usually several head fake rallies along the way. But, as the old Wall Street saying goes, it’s better to be out wishing you were in than to be in wishing you were out. On Tuesday, April 10th, with the $SPX off by 23pts, we had a climax event. This led to the recent rally during which and on a closing basis $SPX added nearly 50pts. This rally, as we all know, was a struggle and IMHO if it hadn’t been for the AAPL pump job the rally wouldn’t have lasted nearly as long. We now know that AAPL is vulnerable to profit taking but what we don’t know is just how much profit is going to be taken from this tech darling and as long as AAPL remains under pressure then so will the rest of the market. I just wanted to compare this past Friday’s data with the data from April 10th so that you can see in numbers what a climax selling event looks like. Everything I’m about to show you is stuff I’ve written about in the past so nothing new and the point is that these events are knowable because they occur over and over. I am purposely and intentionally transferring this knowledge to you. As you can see, April 10th was clearly a climax selling day while this past Friday was not. And it is black and white. It either is or it is not. That doesn’t mean that on some day following a fairly oversold market, like this past Friday, you won’t get a bounce, but it’s just better from a risk/reward stance to wait on the flush out that is climax selling event. It will come. It always does. Keep your powder dry. The decline that has now clearly begun may not lead to a real market bottom for several months. Good luck to us, one and all. Posted in: General Market Thoughts. 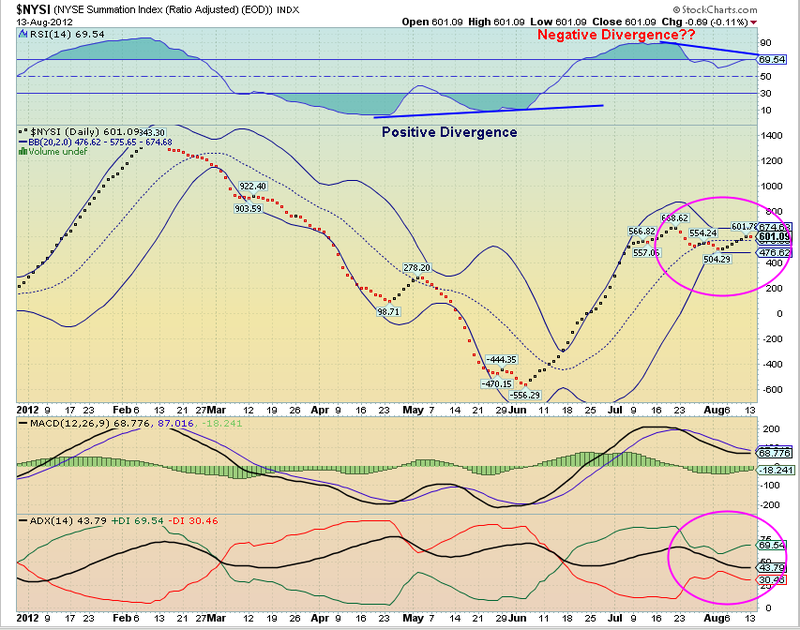 Tagged: $NYSI, $NYUD:$NYUPV, $SPXA50R, $VIX, Zweig Breadth Thrust. Second day with the market going deeper into extreme oversold territory. We should see a bounce tomorrow but only because breadth indicators are saying that the bulk of the selling is over, but don’t quote me. Zweig Breadth Thrust dropped to 35.07 today. However back in the 3rd week of November 2011, ZBT dropped below 40 and stayed below 40 for four sessions. Then, on November 28th, the $SPX shot up 33pts. $NYSI dropped by 103 pts today. Back during the 3rd week of November, $NYSI dropped by about this same amount on two consecutive days, and then that big 33pt rally. $SPXA50R dropped to 31 today. Back during that same 3rd week of November, $SPXA50R hit 21 on two consecutive days, and then the big rally. I don’t know if $SPXA50R will drop down closer to 20 this time, but nothing says it can’t. $NYUD:$NYUPV hit -13.49 today. It can go lower but it will take another big down day for that to happen. RSI on the 60min $VIX chart rose above 75 just after 3pm, then rolled hard closing at 69. $VIX ought to pull back here, but then what do I know? This is all well and good and the market could be setting up for a bounce, but, IMHO, there has been a shift in dynamics with several other breadth indicators breaking down. While I will never advocate shorting the market, it does appear that the safer trade for the moment is shorting the rips as opposed to buying the dips. In times like these, cash is king. Posted in: General Market Thoughts. Tagged: $NYMO With Bollinger Bands, $NYSI, $NYUD:$NYUPV, $TRIN, $VIX, 4 Week New Highs/Lows, 90% Down Day, NYUPV, Zweig Breadth Thrust. Unfortunately the stars are not all aligned, as they were on March 6th. Still, there is a good chance for a bounce tomorrow based on things like $NYUPV, Zweig Breadth Thrust, and 4wk New High/Low Ratio. But there has been a change in market dynamics. Anyone who understands the basics of my system would have expected a pause day for last Thursday, based on oversold, though not extremely oversold, readings from a few indicators. Fer instance: Wednesday, April 4th, was an 84% down day. That was very close to a 90% down day and so the market had gotten awfully close to being extremely oversold. Also on the 4th, $NYMO tagged it’s lower Bollinger Band, so this was showing oversold. 4wk New High/Low Ratio dropped to 14.90 and so this was showing oversold, as well. But, instead of a pause in the buying, like we’ve seen so many times since the October and December lows, what we had last Thursday was a pause in the selling. Today’s action is proof of that. So now we’ve seen a shift in market dynamics and it is probably going to be a while before the pendulum swings back the other way. And why would this be so surprising? Over the last three years, the market has run out of steam at about this same time as the “Sell in May” crowd begins locking in profits so they can start planning their summer’s out on Fire Island. Here is what we have that is showing extreme oversold as a result of today’s action and is the evidence for a bounce of one degree or another for Tuesday’s action. $NYUPV closed at 68.99, when 80 is the line in the sand. On March 6th, $NYUPV closed at 33. Zweig Breadth Thrust has dropped to 39.44 so this is showing extreme oversoldness. ZBT dropped to 40.05 on March 6th. 4Week New High/Low Ratio dropped to 7.21. It dropped to 7.57 on March 6th. 90% of today’s volume went into declining issues so this is showing extreme oversoldness. $TRIN closed at 2.08, which isn’t really showing extreme oversoldness, but it closed at 2.38 on March 6th which I didn’t really consider mega oversold, although it turned out to be a pretty good signal. $NYSI dropped by 76.92 points and this puts it in the range of other climax selling signals in the past. On March 6th, $NYSI dropped by 87 points, if you catch my drift. $NYMO closed 10pts below its lower Bollinger Band when a tag of the lower BB is usually good enough. On March 6th, $NYMO closed 22pts below its lower BB. But $NYUD:$NYUPV closed at -8.39 and I have found over the time I’ve been following this indicator that a reading of -12 or less is necessary in a bottom call thus a reading at -8 is inconclusive. RSI on the $VIX 60min chart closed at 64.30 so there is wee bit more headroom for this indicator. Since after a day like today there is often residual selling early in the next session, it is possible that the RSI for the $VIX will push up to or above 70 in the early going tomorrow and if that should happen then $VIX will go into extreme overboughtness and should then begin to reverse. How they raved about the March gains in the $SPX and now we’re within 8pts of giving it all back. AA earnings after the bell tomorrow and this is often a scary event for longs. If we do bounce tomorrow, it could all come off the table AH. Ski season is over and my wife and I are settled into our new digs, but I’m not going to start posting here on any kind of regular basis. Forget that. However, I have resumed work on a page that will lay out all the breadth indicators and data that I use along with interpretations. I have no idea as to how long it will take me to get this page up but when I do then you’ll be able to have a reference that you can make your own and consult on days such as today. Trust me, it’s never too late to develop an intense level of paranoia which, after all, is just a higher form of awareness.